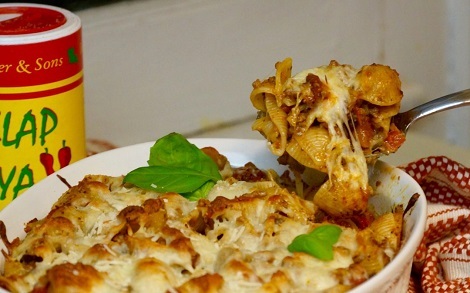 Delicious and cheesy, this pasta dish will be a hit with your family and friends! Serve with garlic bread if desired. In a large sauce pan over medium heat, add butter and onions; sauté until translucent. Increase heat to medium-high, add ground meat and sauté, making sure to cook meat until it is no longer pink. In the same sauce pan, add jalapeños, basil, Slap Ya Mama Original Blend Seasoning, tomatoes and tomato sauce. Mix well and bring to a boil. Reduce heat and simmer for 20 minutes while stirring occasionally. In a 2.5 quart, oven safe dish, add half of pasta and sauce to the bottom of the dish. Layer half of the mozzarella and Parmesan cheese, followed by the remaining pasta and sauce. Top with the remaining mozzarella and Parmesan cheese. Bake at 400 degrees F for 15 minutes or until cheese is bubbly and golden. Top with fresh basil leaves and more Parmesan, serve and enjoy!